From July 28 to August 3, Global Formula Racing successfully competed with both our electric and combustion cars in the highly competitive Formula Student Germany (FSG) event at the Hockenheimring. We want to inform you directly of the events during competition. Thanks for your interest and we hope you have been able to follow our social media feeds while we are competing. 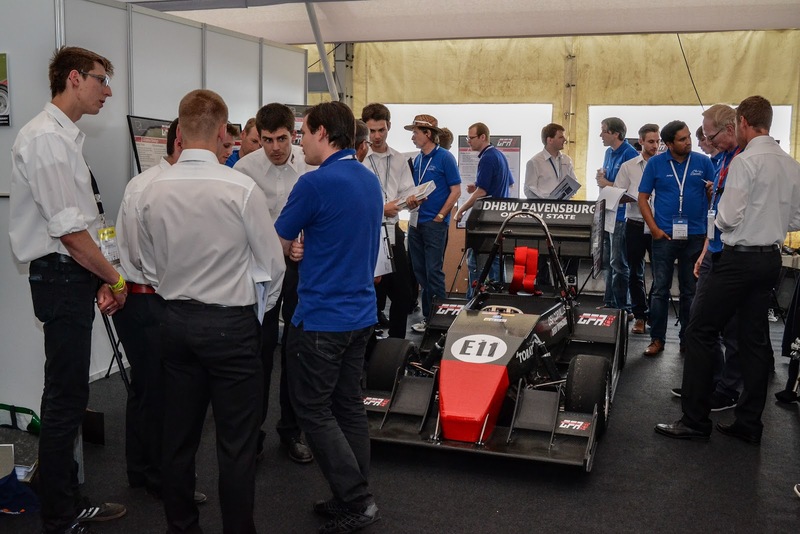 We hope you enjoy this detailed description of the event and our experience at Formula Student Germany. Global Formula Racing took home a solid fourth place overall with the electric car and a first place overall victory with the combustion car. The whole team is very proud of the result and we could not have done it without all of our sponsors and supporters. 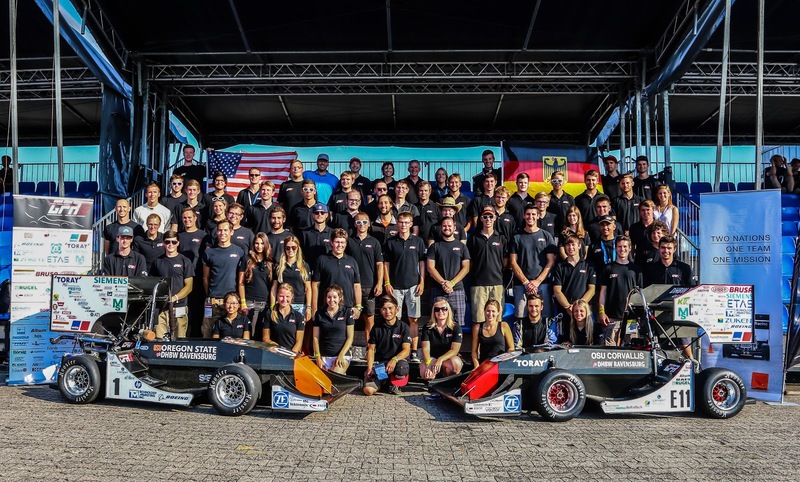 Here’s a day-by-day breakdown of all the action at the Hockenheimring during Formula Student Germany:After our American teammates arrived mid July in Germany, preparation began on the two cars. Once the team had been organized, we were ready to make our way to the European competitions together. After a few great testing days, we were confident in the cars and their performance heading to FSG. On July 28, the team set off for Hockenheim. After we arrived at the Hockenheimring, both the campsite and the pits were set up. Following setup, the traditional welcome ceremony held by the event organizers began. 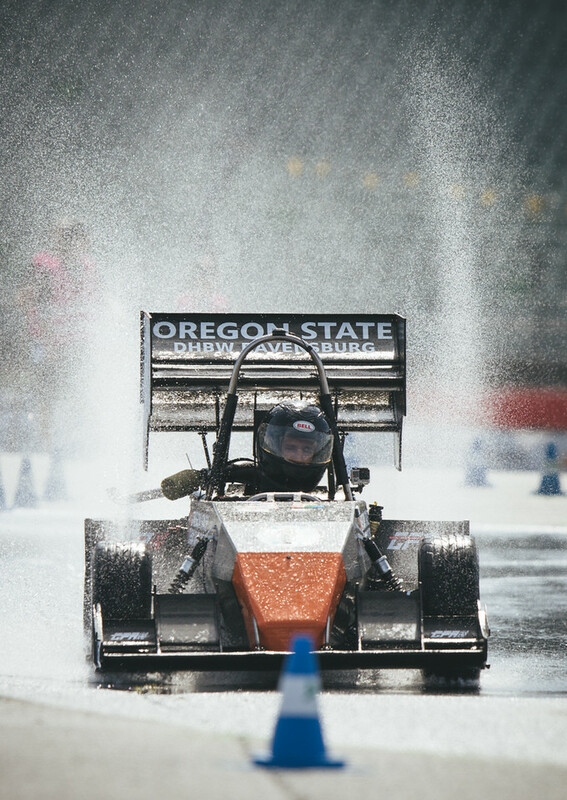 This year, FSG saw a total of 110 teams at competition, split between 39 electric powered cars and 71 combustion powered cars. 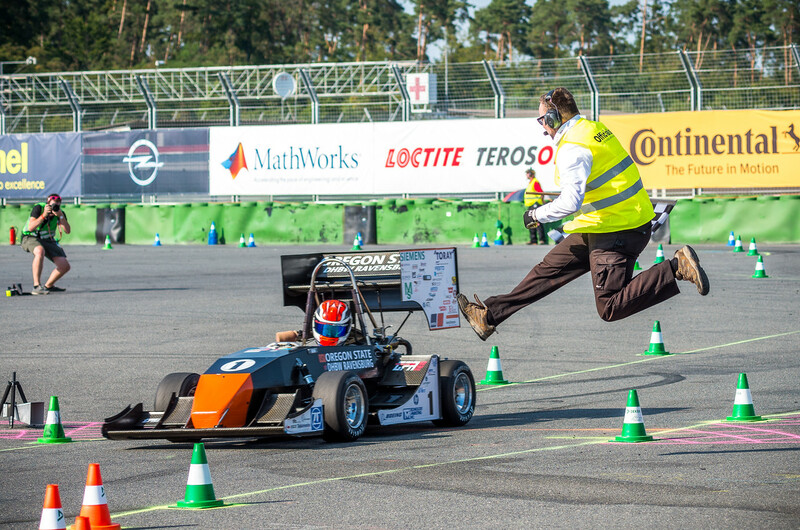 This year was extra special because Formula Student Germany was celebrating its tenth anniversary. Special displays were added this year which included several video contributions, a wall of fame, and an exhibition of some of the winning vehicles from the past decade. all electrical teams. The entire team took advantage of Wednesday to prepare for the upcoming static events. On Thursday, our electric vehicle, the GFR15e, had a full schedule at hand. In addition to the static events, the car also needed to pass technical inspections as soon as possible. The quicker the team passed the inspections, the more time would be available on the test track. The static events included the Design Report, the Cost Report, and the Business Presentation. During the Design Event, the teams explain and defend their technical design to a group of judges. The Cost Report describes the cost of producing a fictional series of 1,000 vehicles, and the Business Presentation is held under the assumption that each race team is a company requesting financial aid from potential investors. This financial assistance will enable the company to mass produce a series of vehicles for their target customers. Overall, the team performed well in the static disciplines against other electric teams and achieved top 10 results in each of the events. The combustion car crew was busy preparing for their static events the next day. Additionally, they were able to use the valuable time on the test track to ensure a solid car set up for the dynamic events. The fourth day at the Hockenheimring would test what we have all worked very hard for; the dynamic events. The afternoon held the first dynamic discipline, Skidpad. 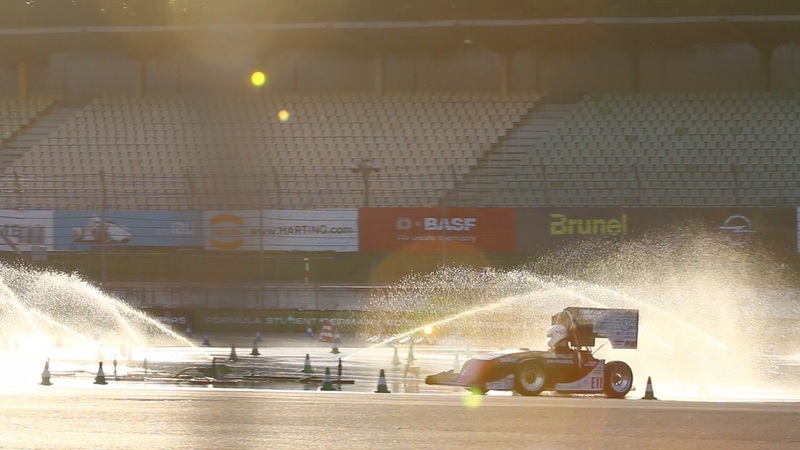 At FSG, this event is uniquely carried out on pavement with sprinklers constantly keeping the track surface wet, a so-called “Wetpad”. The wet ground is especially difficult for the driver, because these circumstances are difficult to repeat and simulate during testing sessions. On top of the busy day and crowded lines to enter the dynamic area, the electric vehicle still needed to pass the technical inspections before allowed on track to compete in Skidpad. For the combustion car, our second driver Brian Boly, would ensure the best overall time for the Skidpad event amongst combustion cars. After the combustion car had completed all disciplines successfully, the whole team was waiting for the electric car to finally complete technical inspection and then head to Skidpad in time. With 55 minutes remaining to run in the event, the GFR15e finally got in line. Since many other electrical teams had similar delays, the line was very crowded near the end with all of the remaining teams attempting last minute runs. Luckily, we managed to get both drivers to complete their two attempts. With all static events complete, Saturday consisted of two dynamic events: Acceleration and Autocross (Auto-X). Acceleration, a distance of 75m, tests the cars time against the clock. The eCar completed the run in 3.76 seconds to take the fifth-fastest time of all electric cars. This made it the fastest two-motor electric car, in contrast to the top four fastest cars which all ran 4-wheel-drive units. GFR’s combustion car completed the 75 meter drag race with a time of 4.21 seconds, giving them a solid eleventh place overall. Auto-X was held in the afternoon, in which there is roughly 1 km of track with straights, corners, hairpins, and chicanes. The position gained in Auto-X determines the starting order for the most important dynamic discipline, Endurance on Sunday. The faster the lap time, the later the team would run in the Endurance event. This system is intended to ensure that vehicles with similar performance and speed can race against each other. Therefore, it is particularly important to drive fast but avoid penalties for hitting cones. The first driver of the electric vehicle, Simon Wickenhäuser, drove a conservative and safe lap to ensure points were scored in the event. Shortly thereafter, the first driver of the cCar, Ryan Thoma, started his run and set new track bests amongst all cars competing. However, these runs were scored as DNFs (did not finish), as the vehicle made illegal contact with the ground in certain areas. Due to the heightened importance of the final two laps for the cCar, the second driver could not allow the car to make with contact the ground. To make matters worse, the queue for Auto-X became very long and the event was ending soon. The whole team helped to make the necessary adjustments to car to ensure it would not hit the ground. The students scrambled to shave the car’s side wings and undertray to be compliant on track. This was an issue for many teams throughout the day. With time ticking down, both vehicles were given the opportunity to make their second run with the second driver. Cautiously, Phil Arscott, the second driver of the cCar, drove a slow lap to make sure the car did not hit the ground. After completing an ‘insurance lap’, he pushed the pace for the second lap and gave the cCar the outright fastest time for the entire Auto-X event. The second driver of the electric car, Tim Fritz, also succeeded in improving their lap time, but was just shy of the Top Five. The five fastest from Autocross are released on the track together to stage the ultimate shootout at the end of the Endurance event on Sunday. Immediately after autocross, the cCar team had another event to attend, the Design Finals. Here, the top six teams from the design event were given the chance to defend their design once again in front of the judges. After Auto-X, the cCar team went straight to the design bays, quickly changed into professional attire, and began discussion with the judges for over two hours. Their engineering knowledge was put to the test. The team finally finished around 10 pm, putting an end to a very long but successful day for both vehicles. On the last day of competition, the most important event of Formula Student is held, the Endurance event. A maximum of 425 of the 1,000 total points can be captured. Thus, Endurance is a make-or-break event. Here, the teams have to complete a distance of 22 km in length with a driver change halfway through the run. Since both vehicles achieved very good Auto-X results, the team waited until late afternoon where both cars were qualified to begin their respective Endurance runs. Until then, the final preparations were carried out at both the electric and the combustion car pit boxes. First up was the electric car. The whole team watched the race from the Formula 1 grandstands! After 18 laps of loud cheering from the stands, the electric vehicle finished the 22 km goal! The GFR15e achieved a very good fourth place overall, only hitting two cones on track. Euphoric with the eCar result, the entire team anxiously awaited the start of the final five. The GFR15c entered the track last. After a successful driver change and a dominating performance on track, the GFR15c crossed the finish line of endurance. Setting times faster than the competition, the crowd went nuts creating a second wave of cheering from the team. Over the race distance of 22 kilometers, Global Formula Racing was almost 25 seconds faster than Stuttgart. In an event that determines a team’s destiny, GFR persevered. We anxiously awaited hearing the final results at the award ceremony later that evening. At the award ceremony, once all the events were complete and the points tallied and checked, Global Formula Racing claimed the overall win for the combustion class! The GFR electric vehicle took fourth place overall in the electric class, barely missing a podium finish! Our team is very proud of the performance and effort from both vehicles! We also congratulate the other teams on their impressive results. 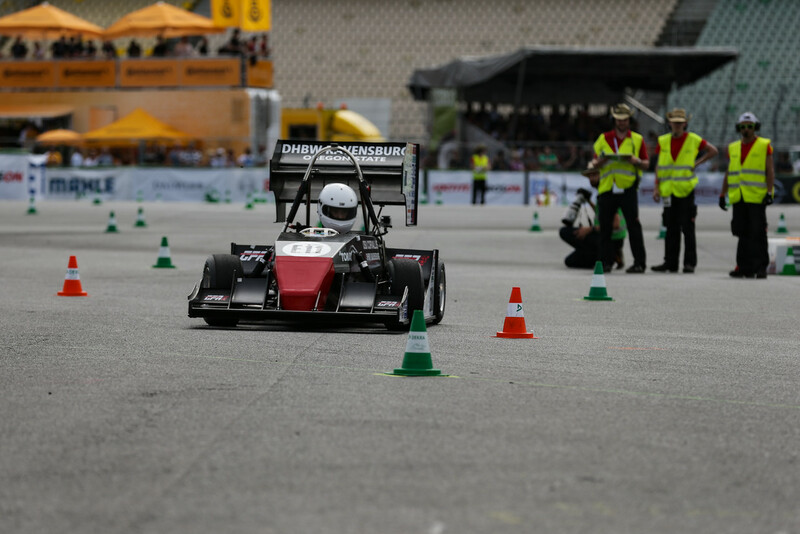 Their hard work, dedication, and sacrifice make Formula Student Germany the most prestigious competition each year!